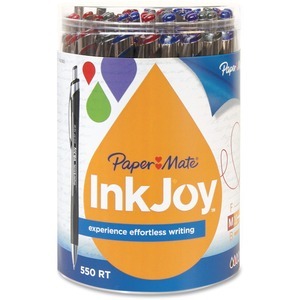 Marketing Information Canister display showcases sleek Paper Mate InkJoy 550 RT in assorted colors. Retractable ballpoint pens feature Paper Mate's revolutionary InkJoy writing system, giving you the best in effortless writing. The InkJoy writing system starts quickly without dragging, requires minimal pressure from your hand, and delivers crisp, clean lines every time. The InkJoy 550 RT Pen combines an hourglass shape with a full-length grip to provide comfort no matter how the pen is held. Metal clip and accents provide long-lasting durability.